Beauty parlors and spas are household names today. Growing up, the only occasion V visited the beauty parlor was to get her hair cut. A bob cut, a V cut, rasna gal cut were norms of the day. When she was around 12, V's mom and grand mom decided she needs to have some curls in her otherwise straight as a stick hair. After few hours, the beautician gave up. Over the years, haircuts were the only think V visited the neighborhood parlor for. Friends moved on to eyebrow threading and waxing and she never jumped the wagon. A couple of years in college and then she decided to attempt the ritual of waxing, sending shock waves at home. But it was too painful and too long for V's hyper-active personality. She threaded her eyebrows for the first time a couple of days before her engagement, stuck to forced home facials by grandma and lived. She did the all bridal thing for her wedding and called it a day. A few months back, after a sunny vacation, the tanned V decided it was time for a facial. She shocked the beautician by telling her that she did her eyebrows 3 years back and never did a commercial facial in life. Today she hits the spas or salons or parlors for a quick haircut, an occasional pedicure and manicure with her girl friends and at times a massage. And then she sees this. A facial and massage for a 2-year old? to relax her? oh yeah! relaxation in a spa for a 3 yr old? And the mother telling she wants the girl to know she is beautiful and she is loved? Isn't she sending a message to the little one that beauty is skin deep? And will the mom's love fade away or lessen if the girl was not having regular spa visits? And where did we get the idea that princess are beautiful? Confidence building by visits to the spa? Aren't there other ways to boost the confidence of your child? I admit, good grooming boosts confidence and isn't it the reason we pick, colors that flatter us and our favorite outfits for that-big-day-at-work. Matching accessories and a dab of her favorite lip color boosts V's confidence levels. But visits to a spa at 2? A lot of mommy bloggers I read have been worried about the influence of fairy tale princess in the lives of their little ones. Fluffy pink dresses, tiaras, glass slippers, white-as-milk complexion and the most-beautiful-girl-on earth. And this is the icing on the cake! This is when I go, what-on-earth-is-the-world-coming-to? And out of curosity, I have added a poll/survey to find out at what age girls typically had their first facial done. Please vote there. Another day, another forgotten shopping trip, another trip to Starbucks for the weak imitation of chai, the magic remains just as strong. There is something about mornings that makes us feel so happy! We fall in love all over again with summer mornings! Somewhere out in the Wild West, along with bustling malls, high-rises and oil refineries, there exists Poohsden. Crazy, busy, bustling, filled with laughter and the usual stuff you would find in a home! The main residents in Poohsden are V, R and the over pampered yours truly - pooh bear! R - the silent, logical and analytical photographer. Loves good food, travel, chess and football! V- the dancer, the RJ-to-be, the environmentalist and anything else that catches her fancy! 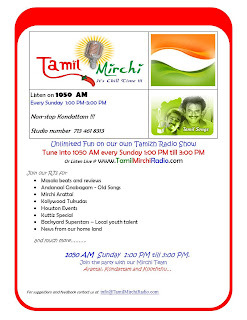 Houston's own Tamil Mirchi is here! And V is a part of the Mirchi team! Tune in and give new RJ V a call sometime for some spicy mirchi aarattai! Little bundle of joy - Baby Sapna is here! Congrats A's! Notes from the Windy City! - to all mothers around the world and the mothers-to-be Happy Mother's day.. a day to celebrate you guys is not enough! A lifetime is more like it! - to V & V - as you step into matrimony... good luck... we hope you both remain happy and smiling forever! As you guessed this weekend is fun-filled and busy! We'll be back in Houston on Monday with more tales!